Narendra Modi secured a major coup: India will receive 3,000 metric tonnes of Canadian uranium over the next 5 years. On Wednesday, Indian Prime Minister Narendra Modi and Canadian Prime Minister Stephen Harper announced a deal that will see Canada’s Cameco Corporation supply India with 3,000 metric tonnes of uranium over the next five years. The deal will be worth an estimated $280 million and is the major capstone announcement to come out of Modi’s trip to Canada, the first standalone visit to that nation by any Indian prime minister in over 40 years. With the deal, Canada will become the first Western nation, and the third nation overall, to supply India with uranium (only Kazakhstan and Russia do so currently). 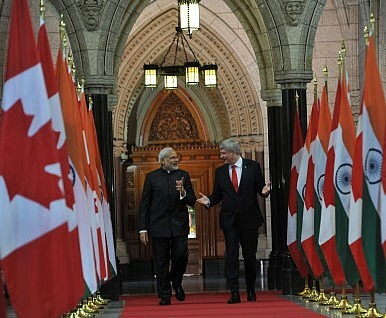 Harper saw the deal as a landmark moment in India-Canada bilateral relations, something that would bring an end to what he described as “unnecessary frosty relations.” “The deal will enable India to power its growth using clean energy,” he added. The uranium supply deal comes 45 years after Canada formally banned all exports of uranium and any nuclear hardware to India in 1974, following India’s “Smiling Buddha” nuclear test (its first ever). Little changed on civil nuclear cooperation between the two countries until a 2013 agreement that allowed Canadian nuclear materials exporters to do business with India under International Atomic Energy Agency (IAEA) safeguards. Under the agreement announced this week, all Canadian uranium supplied to India will be monitored under the IAEA’s safeguards as well. The landmark agreement with Canada comes seven years after India received a historic waiver from the Nuclear Suppliers Group, giving it the distinction of having access to normal nuclear commerce with various countries despite having a nuclear weapons program and remaining a non-signatory party to the Nuclear Non-Proliferation Treaty (NPT). India’s nuclear fortunes shifted ten years ago, once it became clear that the United States would sign a civil nuclear cooperation deal, giving India access to U.S. nuclear technology. The deal with Canada will be another feather in India’s cap as a “normal” nuclear state outside the NPT, a status that New Delhi has slowly been buttressing by pursuing nuclear deals and commerce with several partners while remaining compliant with the requirements of the Nuclear Suppliers Group and working with the IAEA. For India, beyond the diplomatic signaling of concluding a uranium supply agreement with a Western state, the deal will buttress its energy-hungry economic growth, allowing India’s peaceful nuclear program to scale up as necessary. India also remains in talks with Australia for a uranium supply deal. Should that deal successfully conclude, India will have uranium supply agreements with Canada, Kazakhstan, and Australia — three states that together account for over 60 percent of global uranium production. Narendra Modi's time in France, Germany, and Canada showcased his shrewdness as a diplomat.